Dr. Aseem Parekh, Prof and HOD of Orthopaedics and President of Bombay Orthopaedic Society, had the privilege of spending an inspiring half day with the living legend and doyen of Orthopaedics in India, our very own Dr. K. V. Chaubal. The third of four siblings, Dr. Chaubal was born into a family where education and discipline came naturally to the family. Father was a teacher in a government school. An emphasis on the importance of an all round development, also saw his forays into sports. From Elphinstone College, Dr. Chaubal entered the portals of medicine through the Seth G. S. Medical College. His interest in Orthopaedics led him to Nair Hospital from where following a registrar post, he qualified for his M.S. (General Surgery). With a nature, passionate to enhance his knowledge and skills, Dr. Chaubal headed to England to complete his FRCS. Dr. Chaubal’s hard work, diligence and sincerity, that he humbly calls “luck”, saw him take steady and progressive steps upwards from a casualty officer at Lambeth Hospital to a surgical SHO and a registrar. His skills, knowledge and grit as a person and as a surgeon, were due, he felt in large extent to his teachers, Mr. Harold Bolton, Sir Lloyd Griffiths and Sir John Charnley at the Manchester Royal Infirmary. Sir Lloyd although reluctant to see his “good boy” move away to Liverpool, was gracious to give him a high recommendation to broaden his vistas. 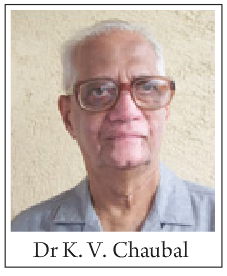 In 1960 armed with FRCS and Mch (Orth), Dr. Chaubal returned to Mumbai. Always modest about his achievement, Dr. Chaubal attributes his entry into Orthopaedics in India as an Asst. Orthopaedic surgeon at the St. George Hospital, as a “windfall”. A JJ fellowship with three other surgeons took him across length and breadth of India and was truly an eye opener and initiation into Orthopaedics in India. He recalls being “back to earth from the stratosphere”, more determined than ever to face the problem inherent in the practice of Orthopaedics in India. Calling himself as a “generalist” in the widest possible sense, Dr.Chaubal was trained in all areas of Orthopaedics and could undertake any challenge in Orthopaedics with his vast knowledge and experience. All this stood him in good stead as he sat out to establish the dept of Orthopaedics at the B.Y.Nair hospital. So many of us that have passed through the portals of this institute know the depth of gratitude we owe to this luminary. Dr. Parekh was particularly struck by the humility of Dr. Chaubal. Unlike many, he gives continued gratitude to his teachers right from his school to graduate and post graduate education. He remembers them vividly, for their knowledge and excellence in imparting it. He has gained much and grown to his present stature from their generous, sympathetic and academic natures. There was never any slacking and discipline and punctuality was sacrosanct. Sincerity, discipline, punctuality and absolute integrity continue to be the mantra of his life. It was at the felicitation function of Dr. R. J. Katrak (on his being awarded an Honorary fellowship of the British Orthopaedic Association), that the idea of starting the Bombay Orthopaedic Society was mooted. This small band of pioneers focussed their concepts and thoughts into making Orthopaedics as a special career. So if today, our vibrant association is 51 years old, it is to this small band that we owe a debt of gratitude. Dr. Chaubal is a man of few words, but one of great depth. It is perhaps, in some of these gems of his that we can get a great insight into him and enrich our lives. 1. I can be progressive only if I listen to other people. 2. You don’t compete with somebody, compete with yourself. 3. Ethics is easier to practise than to define. 4. Is evidence based medicine based on evidence that is cooked up? 5. Experience counts a great deal and surgery is destined to the practice of medicine. 6. You always meet people along the way, you have to learn from them deep down. 7. And finally family upbringing, education and environment determine the person you become. How to Cite this article: Chaubal KV. ORTHOWALKATHON- a Life Time Journey through Orthopaedics. 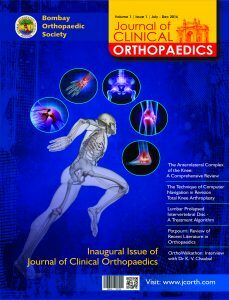 Journal of Clinical Orthopaedics July – Dec 2016; 1(1):62.